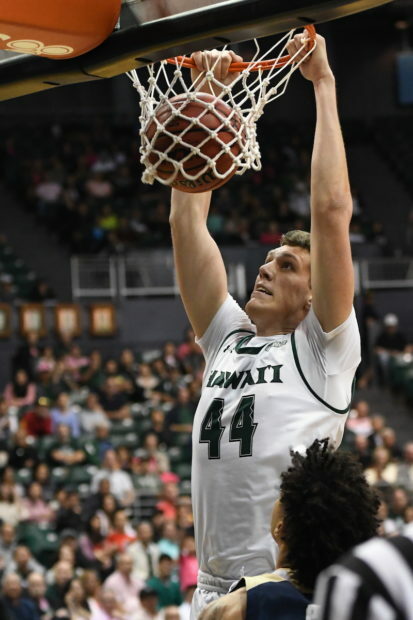 Sheriff Drammeh scored a game-high 18 points and Zigmars Raimo added 14 points tonight to help Hawai’i pull away from visiting UC Davis, 80-60, in Big West Conference men’s basketball action. A spirited “Pink Night” crowd of 6,265 at the Stan Sheriff Center also watched Dawson Carper add 13 points and five boards off the bench and Drew Buggs notch 12 points, 12 assists and four rebounds as the Warriors improved to 12-7 overall and 3-2 in the Big West. Matt Neufield scored 17 points and grabbed six rebounds and AJ John added 16 points for the Aggies, who fell to 5-14, 1-4. UH broke away in the final five minutes of a tight first half, with Jack Purchase’s two free throws snapping a 26-26 tie with 5:58 remaining and starting a 14-6 run that culminated in a 40-32 lead at intermission. The Warriors then opened the second half with a 9-0 run to stretch the lead to 49-32 after Eddie Stansberry’s 3-pointer with 16:46 remaining, and UC Davis could not get closer than 10 points the rest of the way.